He growing epidemic of obesity across the world is associated with an equivalent increase in type-2 diabetes, which results from the body’s ineffective use of insulin. Obese people often develop inflammation in their fat tissue, which, in turn, can reduce the sensitivity of fat cells to insulin, resulting in type-2 diabetes. EPFL scientists, working with researchers from Italy and the Netherlands, have shown that bile acids activate a little-known receptor to overcome the loss of insulin sensitivity, forming the basis for a new class of drug against type-2 diabetes. Diabetes develops when the body has problems with insulin, a hormone that regulates sugar levels in the blood. This results either because the pancreas cannot produce enough insulin or when the body cannot use insulin efficiently. There are two types of diabetes: type 1, which usually starts at young age, and type 2, which accounts for 90% of all diabetics and is generally caused by obesity. Bile acids have traditionally been thought to be restricted to the small intestine, helping with the digestion of lipids. 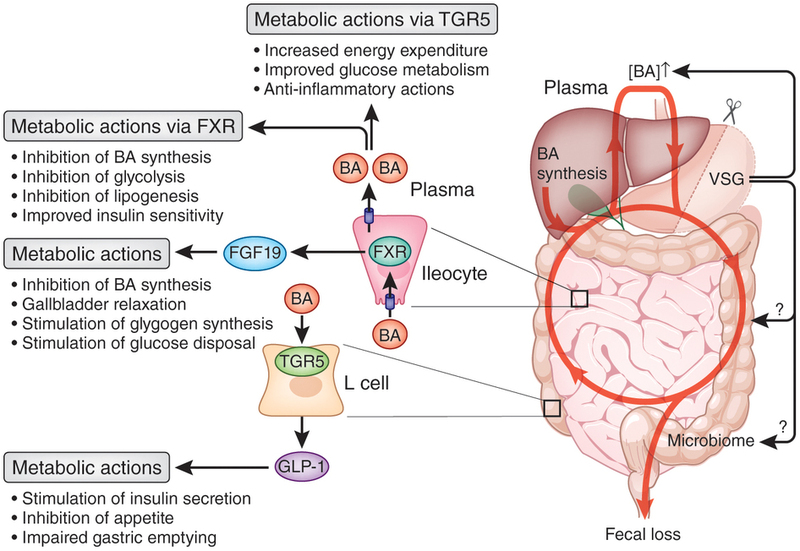 But recent studies — many led by Schoonjans — have shown that bile acids also enter the bloodstream and behave like hormones, acting on receptors like TGR5, and affecting the behavior of different types of cells.